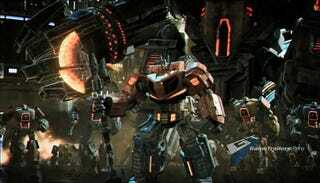 Set before the Transformers had contact with Earth, War For Cybertron allows players to partake in the battle between Autobots and Decepticons. The game is being developed by High Moon Studios, best known for the Bourne Conspiracy game. The title's release date is still TBA, but Transformers: War For Cybertron will be hitting the PS3, the Xbox 360 and the PC.